An investigation has been launched after the death of a 17-year-old boy. Emergency services were called to Berrisford Road, Peatswood, Market Drayton in Shropshire at about 23:25 GMT on Friday, following concerns for a teenager. 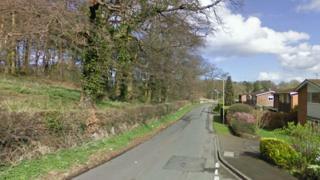 The 17-year-old was taken to Royal Stoke University Hospital where he later died, Staffordshire Police said. The force is treating his death as unexplained and a post-mortem examination will take place next week. A man, aged 18 and from Market Drayton, was arrested in connection with the incident and has been released on police bail. Four teenagers, two 16-year-old girls, and two 17-year-old boys, all from Market Drayton, are also assisting with inquiries and have been released under investigation. The boy's family have been informed.